Mix all ingredients except sour cream and pecans. Oven Directions: Heat oven to 400°F. Generously grease cookie sheet. Drop sweet potato mixture by teaspoonfuls onto cookie sheet; flatten slightly. Bake 12-15 minutes, turning once, until golden brown. Skillet Directions: In a 12-inch skillet, heat 1/4 cup vegetable oil over medium-high heat. Drop sweet potato mixture by teaspoonfuls into skillet; flatten slightly. Cook 4-5 minutes, turning once, until golden brown; drain on paper towels. Top with sour cream. Garnish with pecans. If you’re unfamiliar with latke, allow us to introduce you to one of our most favorite ways to eat potatoes. Also called potato pancakes or boxties, potato latkes are a staple in Jewish cooking, especially for Hanukkah. Potatoes are grated or ground and then seasoned and then fried for a crispy potato dish that can be served as a side dish for holidays or as a finger food-appetizer that can be dipped in sour cream or ranch. 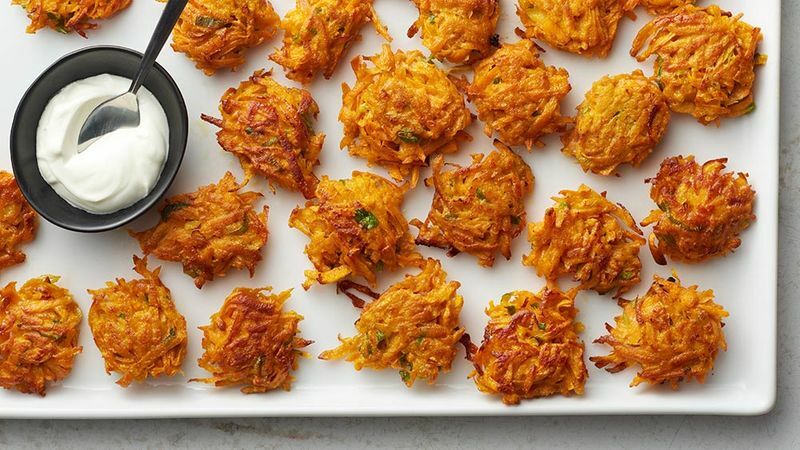 We did a twist on traditional (obviously) and made these sweet potato latkes. It follows the same concept as the classic Jewish version, but uses sweet potatoes instead of white potatoes. In this recipe, we recommended dipping the sweet potato latkes into sour cream but you could also take a sweet approach and dip into real maple syrup. That’s what we love about sweet potatoes —they can be sweet or savory, and you can prepare them pretty much however you want.